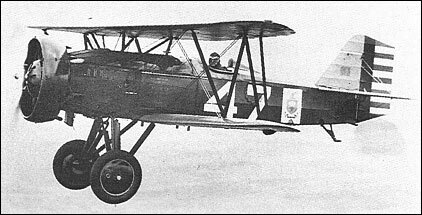 The first radial-engined Hawk resulted from the mating of a P-1A airframe with a 390hp Curtiss R-1454 engine as the XP-3 in October 1926. The failure of the Curtiss engine led to its substitution by a 410hp Pratt & Whitney R-1340-9, with which it was tested in April 1928 as the XP-3A. Five production examples had been ordered in December 1927 as P-3As, deliveries commencing in September 1928. The P-3A was powered by the R-1340-3 version of the Wasp, also rated at 410hp, and the first production example was flown with various experimental cowlings as the second XP-3A. Both this and the original XP-3A were eventually to become XP-21s, the second XP-3A undergoing further conversion (after testing as an XP-21) to P-1F standards. Armament of the P-3A comprised two 7.62mm machine guns and this type was fitted with a Townend ring after service entry.